The International System of Units, informally known as the metric system — the way in which the world measures everything from coffee to the cosmos — will change in a way that is more profound than anything since its establishment following the French Revolution. So, let’s talk about the volt. The volt is a derived unit which means that once the kilogram, meter, second, and ampere are defined, the equivalence of mechanical and electrical power dictates the definition of the volt. See the formal definition above. 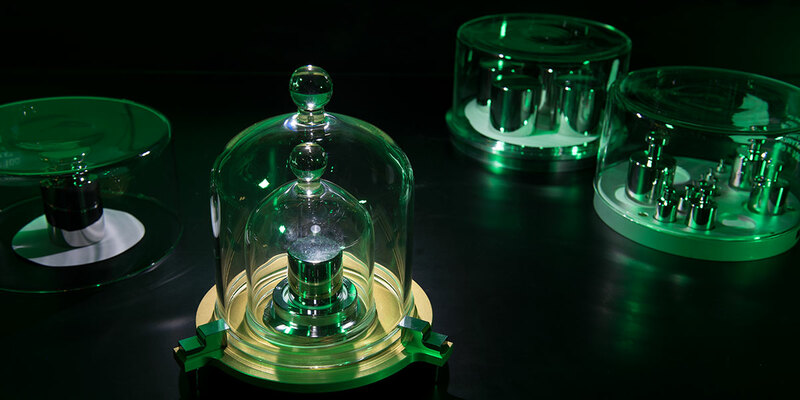 Since neither the surface of the Earth or a box of water make useful working standards, the formal definition of the meter became the distance between two scratches on a platinum iridium bar, and the kilogram became the mass of a cylinder of platinum-iridium. Both these artifact standards have been preserved for more than a century in a vault at the BIPM (Bureau International des Poids et Mesures) near Paris. Beginning about 1900 with the development of quantum mechanics, it became clear that nature has constants that are more fundamental than the details of the Earth. With the invention of atomic clocks, the second was the first quantity to be redefined in terms of a fundamental constant and is now defined as the duration of 9 192 631 770 (ƒcs) oscillations of the Cesium atom. The Josephson effect (V = hƒ/2e) has connected the volt to a known frequency ƒ and the constants h and e (e = electron charge and h = Planck’s constant). The Von Klitzing Effect has made possible a laboratory realization of the quantum resistance h/e2 = 25812.80757 ohms. Figure 1. The golf ball sized cylinder of platinum-iridium that has defined the kilogram since 1905. If we could apply a known force to an unknown mass and then m easure the acceleration, we could calculate the mass. 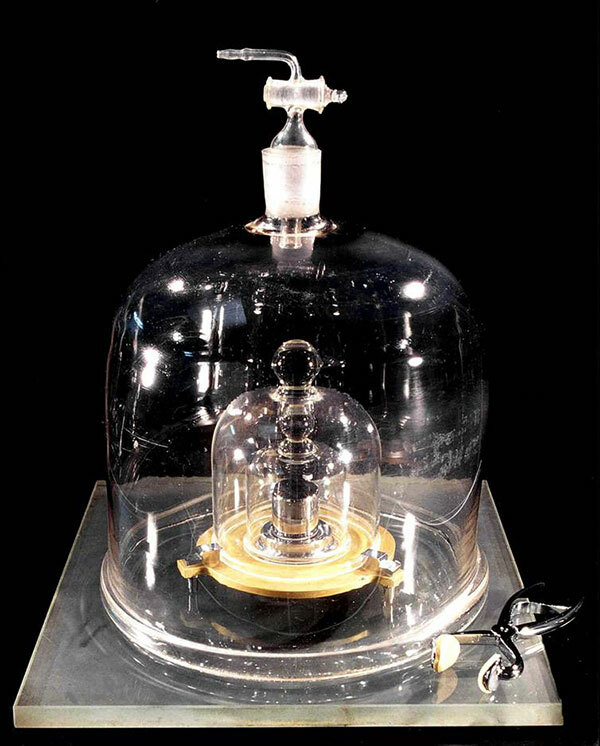 The problem is that to be an improvement over the artifact kilogram, both A and F should be measured to better than about three parts in 108. Figure 2. 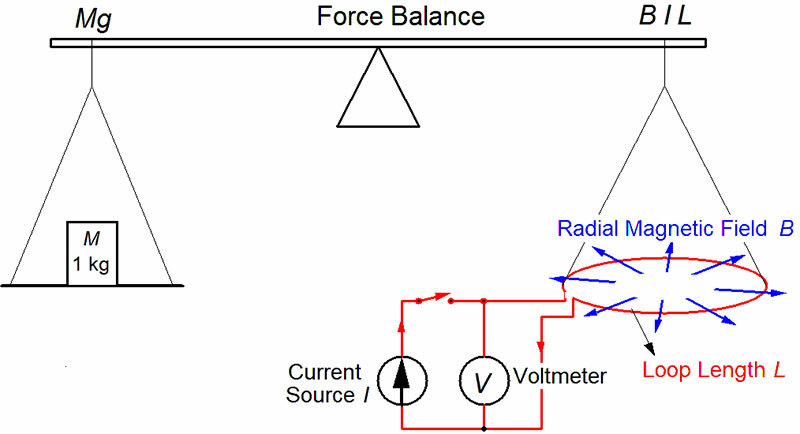 This apparatus compares electrical and mechanical power and is generally referred to as a watt balance (BL ≈ 50 Vs/m). Since V and S can be measured with high accuracy, the product BL can be calculated BL = V / S — in effect calibrating the apparatus without the need for a detailed knowledge of the magnetic field or the coil geometry. V, S, I, and g can all be quantum-based measurements as described above. The equation above shows that this apparatus equates electrical and mechanical power, so it’s commonly called a Watt Balance. As a result from the Josephson equation for voltage of the volt, when we place a known mass on the balance, the experiment boils down to a measurement of Planck’s constant h in terms of the kilogram, meter, and second. 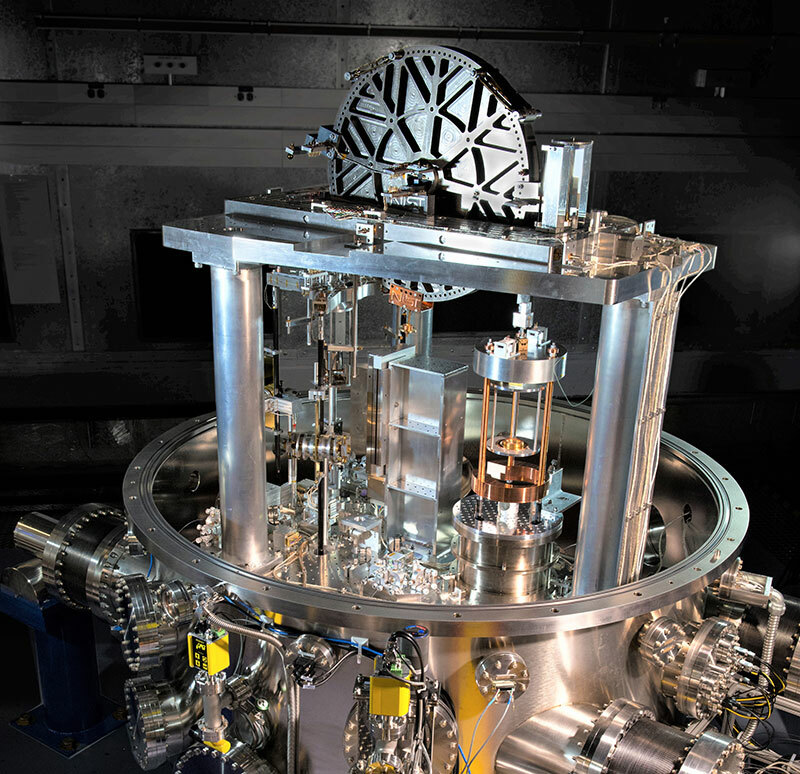 Conversely, by defining the value of h together with already defined values of c and ƒcs, the kilogram becomes a quantum-based unit wholly derived from the definitions of e, h, c, and ƒcs. As a science project in do-it-yourself physics, it’s fun to imagine other ways to make a mass measurement by equating mechanical and electrical energy; something simple that might achieve 1% or better accuracy. My first thought was to use a DC motor to lift a mass M at a constant speed S.
From the point of view of universal elegance, the motor lifting experiment — as well as the watt balance experiment described above — fall short because both measurements must be performed in a measurable gravitational field. If we were traveling in a space ship to another solar system, these methods could not maintain a quantum-based mass standard along the way. where M is the mass of the cylinder in kg, D is the diameter in meters, and ƒ is the rotational velocity in revolutions/second. We measure D with a digital caliper (our length standard). When the start button is pushed, a constant current is applied to the motor. As it spins up, ƒ is compared to a preset stop value ƒs. 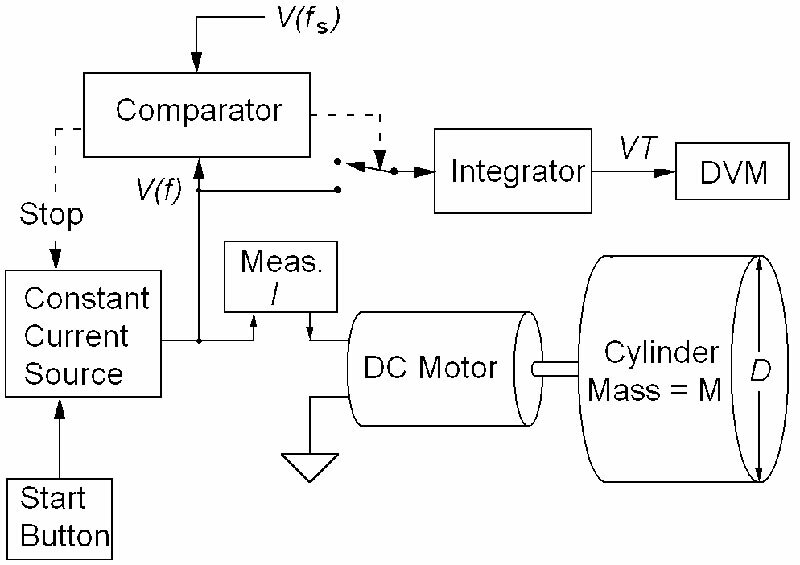 At the same time, the product VT is accumulated in an integrating amplifier. When ƒ = ƒs, the integration is shut off. I is measured with an ammeter. 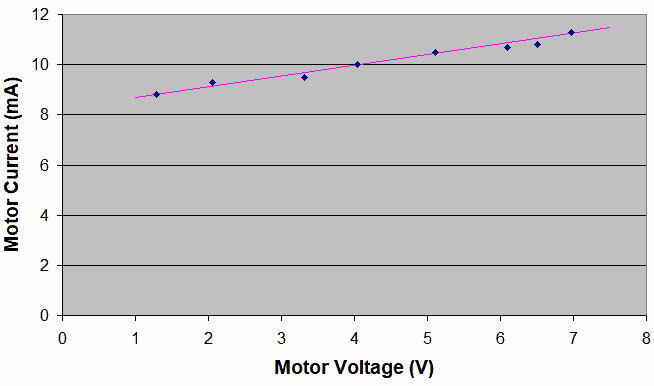 VT is measured with a voltmeter, and we have everything required to calculate M.
Figures 5 and 6 show a measurement circuit and its PCB (printed circuit board) that is designed to power the motor, plus make possible the accurate measurement I, VT, and ƒs by eliminating the effects of friction and resistance losses. 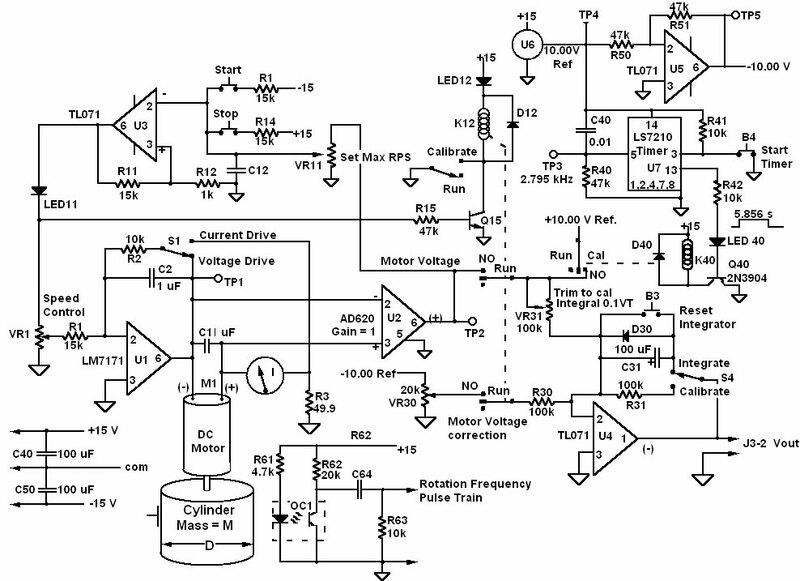 While Figure 6 looks complicated, it’s just the combination of four relatively simple circuits. At the upper right, U7 is a programmable timer that is used to calibrate the VT integrator U4. The LS7210 has an internal oscillator with a frequency set by C40 and R40; in this case, 2,795 Hz. The timer counts a specific number of oscillations set by five digital inputs at pins 9-13. Grounding only pin 13 sets the count at 16369, yielding a time delay of 5.856 s.
The circuit of Figures 5 and 6 has five modes of operation: four calibration modes and one run mode. In mode 1, we’ll calibrate integrating amplifier U4 by applying a 10.00V reference voltage input for a precise time and then adjust the gain so that Vout equals exactly 0.1VT. The 10V reference voltage and Vout are both measured with our voltage standard: an Agilent 34420 six-digit voltmeter. In mode 2, we calibrate the motor voltage by correcting out the component of motor voltage caused by the motor resistance. With 25 mA applied to the motor, we prevent the motor from spinning so that the motor voltage is I Rm where Rm is the resistance of the motor. Trimpot VR30 is then adjusted to subtract the voltage I Rm from the input to the integrator. This ensures that the part of the motor voltage associated with resistive loss is excluded from the integrator output Vout. In mode 4, we set the integration stop point to occur when the rotation rate ƒ is at a precise value. With 7V applied to the motor, adjust VR11 slowly CW until comparator U3 trips off. This sets the spin-up stop point at a known frequency ƒs, measured as described previously. Mode 5 is the main measurement mode — what we’ve been getting ready for. Press the reset button to zero the integrator and the start button to start the spin-up and the VT integration. When the rotation rate ƒ reaches the set point ƒs, latch U3 will turn the motor and the integration off. The DVM will read the 0.1VT product — the last data point needed to calculate M.
Table 1 is a spreadsheet showing experimental data and the resulting mass calculation for a range of drive currents I and cut-off frequencies ƒs — all of which should produce the same result. The scatter of the results in Table 1 is a measure of the uncertainty of the mass determination. The average of the five measurements shown is 0.213 Kg. I would expect it to be slightly high because I havn’t accounted for the mass of the rotating parts in the motor which add about 1% to the total moment of inertia. My kitchen scale gives the mass of the rotating cylinder as 0.210 Kg. This little science project tries to give an inkling of the complexity of metrology research. 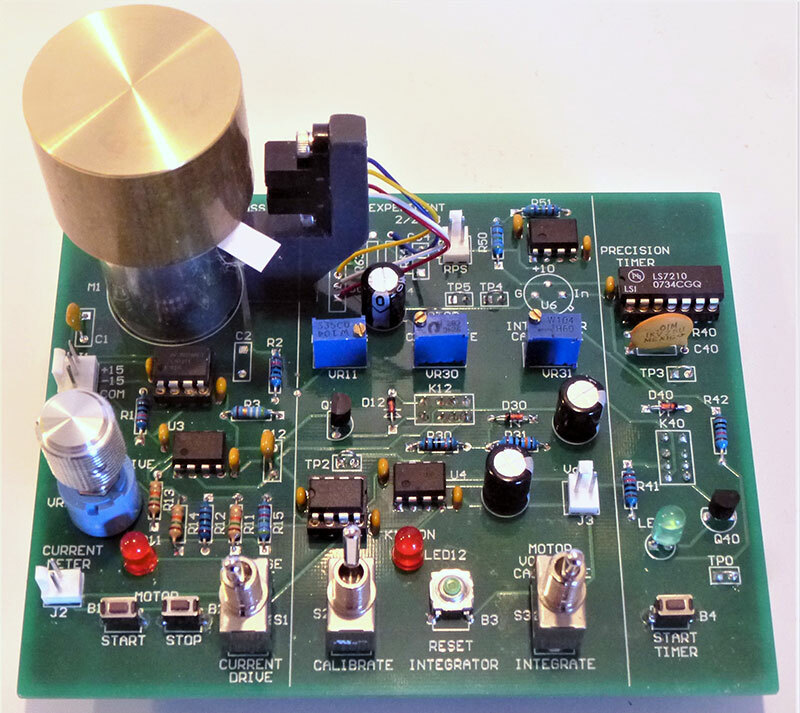 It touches a multitude of areas in physics, electrical engineering, and metrology including energy, power, and moment of inertia calculations, op-amp circuit design, DC motors, error correction, and uncertainty analysis — a perfect combination for a physics or EE lab experiment. 1 PCB A limited supply is available in the NV webstore and comes with the LS7210* (U7). Gerber files are also available in the downloads.